The need to transfer fluids laden with solids or abrasive slurries is common in upstream oil and gas production. PCM transfer pump is the ideal choice for feeding de-sanders and centrifuges. It can also be used to transfer drilling fluids, produced water with fracking proppant and sand-laden oil. During well testing and drilling operation, drilling fluids carry debris from the drill bit to the surface. At the surface, fluids contaminated with water, base oil and fine solids are transferred to a centrifuge for treatment. 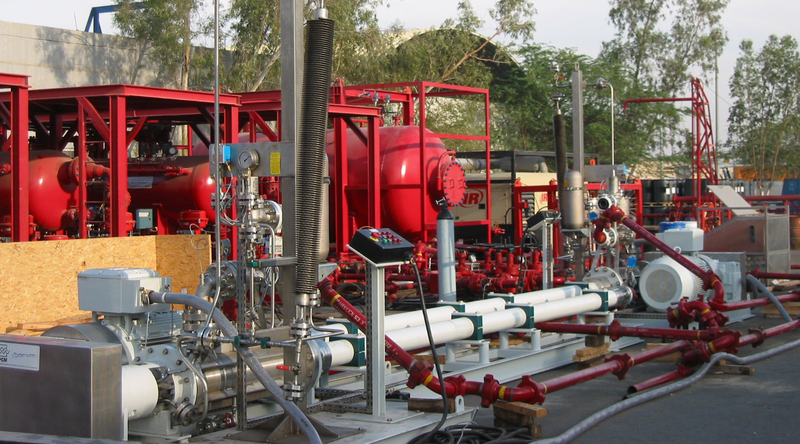 Why choose PCM for well services? PCM transfer pumps efficiently feed fluids to the centrifuge, with minimal change in flowrate over pressure, viscosity or solids content fluctuations. Proportional pumps speed adjustment using variable speed drive ensures easy flow rate adjustment without compromising performance. Constant non pulsating, PCM pumps can transfer fluids with heavy solids content at high pressure avoiding the need for auxiliary equipment or several parallel pumps. Designed to provide easy installation on a rig and low-maintenance, reliable operations in harsh offshore conditions, PCM develops heavy-duty mobile skid solutions for pumping the oil mixed with water and gas produced during well testing. PCM transfer pumps are the smart choice for a wide range of transfer surface applications thanks to the PCP technology. The PCM Moineau™ A Series is the perfect combination of API standards and PCM progressing cavity pumps expertise. It is ideally suited for a wide range of onshore or offshore oil & gas applications. PCM surface pumps can be highly customised to obtain any configuration adapted to a specific installation, meeting project specific challenges and operators’ own unique asset standards. PCM provides EPC customers with a unique engineering response and project management support.